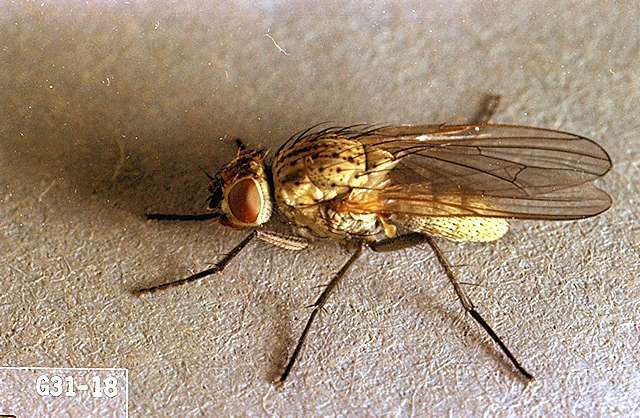 Pest description and crop damage The seedcorn maggot adult is a slender, light gray fly about 0.19 inch long. It looks much like a small housefly. The whitish eggs have slightly raised ridges running the length and width of the eggs forming tiny rectangles. Larvae are about 0.25 inch long, white to whitish yellow, cylindrical, and tapered, with the smaller end in front. Pupae are small brown capsules. 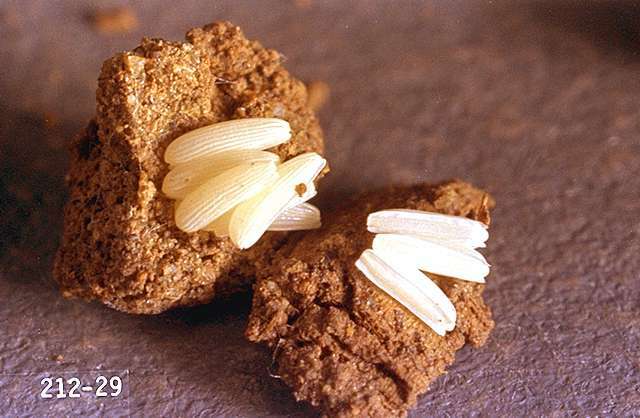 The seedcorn maggot is abundant during or following a wet cycle, primarily in spring, and is most common in fields containing a high amount of residue from a previous crop or where manure has been spread. 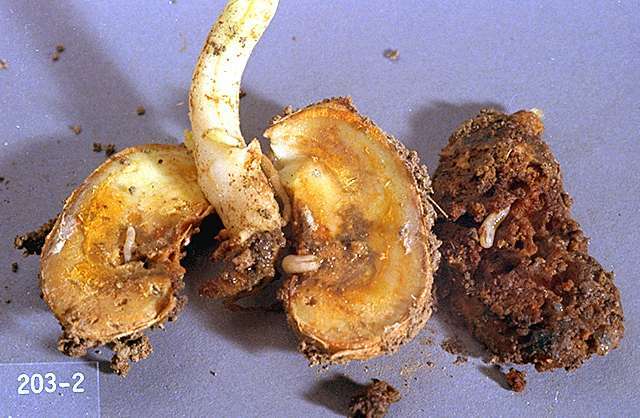 Seedcorn maggots burrow into seeds and developing embryos in the ground, damaging and destroying seeds and creating sites for rot. They may spread bacterial soft rot. bifenthrin/avermectin (Athena) at 0.06 to 0.12 lb ai/a at plant. REI 12 hr. Do not exceed 0.056 lb ai/a avermectin or 0.3 lb ai/a bifenthrin per season. bifenthrin (Brigade 2WSB) at 0.05 to 0.1 lb ai/a in-furrow with seed or transplant. REI 12 hr. Do not exceed 0.3 lb ai/a per year. bifenthrin/IBA (Empower 2) at 0.04 to 0.1 lb ai/a. PHI 3 days. REI 7 days. Do not exceed 0.3 lb ai/a per season. Retreatment interval 7 days. chlorpyrifos (Lorsban 50W) at 1 oz ai/cwt seed. Pumpkin only.